Left to right: Nicholas Caldwell, Walter “Scotty” Scott, Wallace Scott and Leaveil Degree. Nick Caldwell, one of the founding members of the legendary R&B group The Whispers who are best known for their #1 R&B hits “Rock Steady” (1987) and “And The Beat Goes On” (1980), has died as a result of heart failure. He was 71. Mr. Caldwell was born April 5, 1944 in Loma Linda, CA. His first industry gig was working with Sly Stone who was a San Francisco area disc jockey prior to launching his band Sly & the Family Stone. 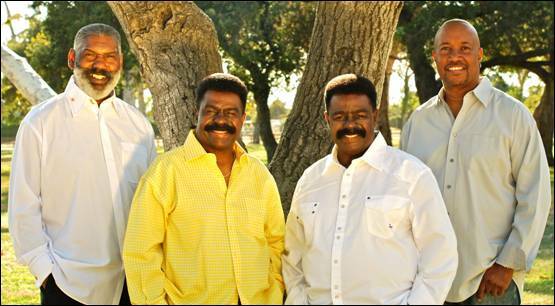 Later on, he formed The Whispers with his high school buddies – twin brothers Walter & Wallace “Scotty” Scott. They added Marcus Hutson and Gordy Harmon (replaced by Leaveil Degree in 1973) and they initially patterned the group after The Four Freshmen pop group but eventually developed an R&B style. The group first recorded “It Only Hurts For A Little While” for Dore Records in 1964 but didn’t score their first Top 20 hit until “The Time Will Come” in 1969. Although, they enjoyed Top Ten hits such as “(Let’s Go) All The Way” and “Make It With You” in the 1970s they climbed to a higher level of success in the 1980s when they delivered a string of Top 5 R&B smashes such as “It’s A Love Thing,” “Keep On Lovin’ Me” and “In The Mood.” The 1980 hit “And The Beat Goes On” spent five weeks at #1on Billboard’s R&B singles chart. Their signature tune “Rock Steady” spent one week at #1 on the R&B singles chart and was the group’s highest charting Pop hit where it rose to #7 in 1987.